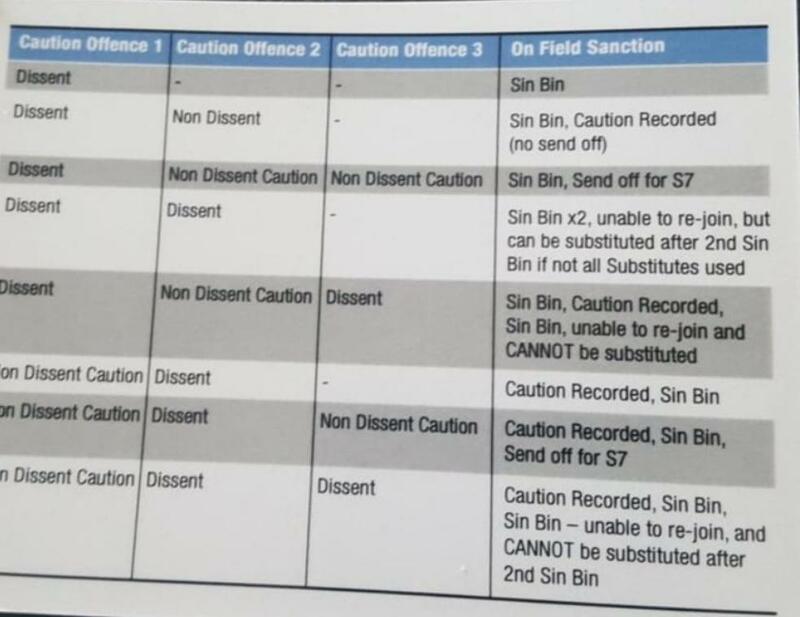 Sin Bin's are on the way to Step 7.... also maybe 6 & 5??? No swearing please or you're 'in the bin'!!! Yep. 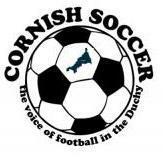 Discussed with SWPL secretary in this week’s CS podcast. Will be interesting to get further guidance when available if all dissent will be dealt with? Swearing outload to yourself, swearing at an opponent, team mate, referee, management, how far does this go? Answer is dont swear, but easier said than done! We know the part management and players need to play in this, but referees (who all dont officiate in the same manner) will soon be called to task on how strict the implementation of this goes! Im guessing a good trial run would be pre season for clubs and match officials alike? Nick, sorry to be pedantic but swearing is not dissent, that is foul & abusive and is a red card offence the sinbin is a yellow card and is for dissent only. Going to need some big bleddy bins! Oh gawd that's a red for me right away. So things like constant moaning to the ref... what other examples are there? Slamming the ball down when a free-kick/throw-in is awarded against a decision. Moaning at the referee but, not using OFFINABUS language. It is in the opinion of the referee though so each will have slightly different opinions. Foul & Abusive has been a red card for many years.When The FA tried to highlight this many years ago, I can remember Refs coming into dressing rooms pre match & saying “No jewellery or swearing “. Trouble is not enough refs had the balls to enforce this. It is far easier to hand out 2 yellows for pathetic offences, against which there is no appeal, go home press a button on the computer. No report required, job done ! Who would be a club football secretary or player these days. Basically, it's the old Caution for Dissent towards Referee or Assistant Referee (C2). You have to play with 10 men for 10 minutes while he sits down and calms down. Rather than a £10 fine in the post on Monday, the team suffers. Especially in the last 10 minutes of the game because that, in effect, is game over for that player. I'm not sure what the fines or points are to the Club. It's harder to enforce in the Duchy League as there may not be dugouts and perimeter fences etc but I am starting to get used to it. Players will take a lot of getting used to it but I am ok with it. It works better when you use 'rolling subs' so not sure how popular it will be on swpl. To be absolutely clear, the Laws of the Game state "foul OR abusive language". It doesn't have to be both! How is the 'sin bin' going to work, I can see enormous problems for match officals, players, club linesmen etc. It would be nice to see the views of the match officials who seem to be in favour or have not made much objection to it through their association. 1. Who will actually keep the time the player is off the pitch ? 2. Can a player be sent to the bin just before the end - what happens to the remaining minutes, do they carry over ? 4. If so how do you keep a record of the time in the bin, every time that play is stopped ? 5. How on earth would a match official keep the times of several players off the pitch at the same time, plus different stoppage time to be added to those players. 7. With all these problems and many more it would be so difficult for match officials to send off more than one at one time, they would not want to do it and unless some form of help with the timing is devised they wont do it. 8. Must have been thought up by these graduate entries that the FA have at Wembly, never kicked a ball in their lives. Dear o dear what has it come to. It'll boil down to the referee's interpretation of 10 minutes which is fine by me. Of course there will always be a multitude of persons screaming in his ear about exactly how long the offender has been in jail! He will definitely not be allowed to forget. The Sin Bin is only for dissent so Home Waters ensure your players don’t offend and the ref won’t have any problems! The FA are delivering training to Step 5 and 6 clubs and Level 4 referees. You obviously don't get the point - its only when the ball is in play that time in the bin counts - how will the referee keep the time for each different player that is off - having never been to a match in over half a century without dissent at one point or another, you are very naive Dave, to argue that the system will only work if there's no dissent, is not an argument to say it will work. What if the keeper is sent off - then I presume a remaining outfield player can be substituted by the reserve keeper, then when he is back do a reverse substitution. You havn't answered any of the questions at all really and TOIGTBIW just to say the crowd will let him know is rather silly to say the least. Dissent is well down at Duchy level since its introduction..having seen several SWPL fixtures this season it's high time this was brought into the higher levels of the game. You obviously don't get the point - its only when the ball is in play TOIGTBIW just to say the crowd will let him know is rather silly to say the least. Think about it, do you think the manager and spectators will not keep reminding him ? Not sure how many players you’re expecting in the bin at the same time! The stats rolled out in the Duchy and Trelawny League training suggested that the number of yellow cards given for dissent was actually very low anyway. The Sin Bin idea for dissent would of course work if the players kept their mouths shut in the first place. Countyman - you don't need rolling subs to do the swop - keeper comes off - sub please ref - among the five named subs is a keeper - take off the centre forward and keeper two goes in goal - when time is up - sinned keeper goes back on in goal - club say sub please ref - take off the sub that went on and replace him with another named sub. At least then the club has kept a 'keeper' on the field, but lost a player they may not have intended to sub during the game, or they may have. I fully accept its the players fault, of course, but that doesn't make the system that is going to punish them an efficient system and easy for match officals to carry out, easy for players left on the field to try and circumnavigate the time gap. The time isn’t ball in play, but 10 minutes playing time. So the stoppages will be the same if more than one in the bin. Also write down time in bin, can’t be too hard to remember time back on. Sin bins, what ever next. If referees had the strength, could have used another word. To book and then send off players there wouldn't be the need for any of this twaddle. I have used this system in the 2 year trials in the Duchy League and Junior Cup - so hopefully these answer your queries. Does it work, i hear you ask - sometimes is the answer. If clubs embrace it then yes, it works, if not it can be something else to berate the officials - Roll on next season with the red and yellow cards for all Managers etc on the bench. Only Players on the actual pitch can be sent to the sin bin - substitutes on the bench receive a standard yellow card. Have a gander at this!